Couric with Grammy nominee Lil' Wayne; Eubanks in his element. CBS isn't done with Katie Couric just yet. On the contrary, she'll be getting a double dose of prime-time exposure on the next two Wednesdays in hopes that more viewers might then be swayed to give her CBS Evening News a look. On Jan. 28th, a one-hour special edition of the Evening News will air at 7 p.m. (central). Executive producer Rick Kaplan says it's "just another platform to bring our distinct reporting and franchise news series to a wider audience." Couric will have to go against American Idol, though. On Wednesday, Feb. 4th, CBS has the 8 p.m. (central) hour reserved for Katie Couric's All Access Grammy Special, during which she'll interview and play around with Justin Timberlake, Lil' Wayne, Katy Perry and Taylor Swift. The Grammy Awards ceremony will air the following Sunday, Feb. 8th, on CBS. Couric still trails the NBC Nightly News with Brian Williams and ABC's World News with Charles Gibson in the national Nielsens. The latest numbers showed Nightly News comfortably on top with 10.48 million viewers for the week of Jan. 12-16. World News had 8.97 million viewers and Evening News 7.45 million. It looks a bit brighter for Couric among 25-to-54-year-olds, the main advertiser target audience for news programming. In that measurement, Nightly News had 3.50 million viewers, followed by World News (2.94 million) and Evening News (2.37 million). Couric finishes a heady second in one measurement -- 18-34-year-olds. But only a small percentage of viewers in this age group have any interest in the traditional dinner hour newscasts. For the week of Jan. 12-16, Nightly News drew 776,000 viewers in the 18-to-34 age range, with Evening News second (554,000) and World News lagging (538,000). 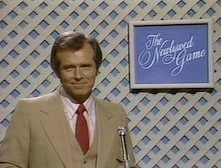 *** Want to make whoopee with game show evergreen Bob Eubanks? He'll be the main attraction at the Grapevine Heritage Foundation's fifth annual "Jubilee Event" on Friday, Feb. 6th. Tickets are $75 per person, and you can get more information here. Ross Bannister, director of Heritage Programs and Preservation, describes the event thusly in an email to unclebarky.com: "Jubilee is a super nice cocktail party with heavy hors d'oeuvres, martini bar, live music and so forth. Then, once everyone is all wound up, they go to the Palace Theatre for a live version of The Newlywed Game with the real Bob. He's a lot younger than you might think." Eubanks is 71 and still nicely preserved. It helps to have a little upkeep done on the old upper case.